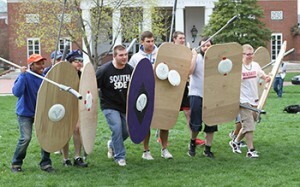 Students in Professor Bronwen Wickkiser’s course Paideia: Citizen, Soldier and Poet in Classical Greece took to the Mall to try their hand at hoplite warfare. Success on the ancient battlefield depended upon each solider working in unison with his comrades, organized into tight rows called phalanxes. In classical Athens and Sparta, as well as other city-states, hoplite warfare was essential to the polis. Each citizen was required to fight, and the use of phalanx warfare reinforced the idea that each citizen was as integral to the well-being of his city as the guy next to him. 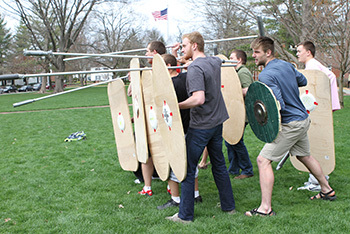 In order to get a feel for this type of warfare, Wabash students armed themselves with shields, spears, and swords, formed into two opposing armies (Athenians vs. Spartans) and advanced against each other, experimenting with various maneuvers. Lessons learned: how difficult it is to move with heavy armor (students wore backpacks full of books to approximate the typical weight—65 lbs.—of hoplite armor), how useful a spear can be at farther range vs. a sword at closer range, and even the sounds of ancient battle, including marching songs (paeans) that armies used when advancing against the enemy. One student commented that the hardest part of the experience is the discipline necessary to stay in line and not break rank. Click here to see more photos from the battlefield. “People often ask me what Wabash is all about,” said Professor Emeritus of Classics John Fischer H’70 to guests gathered Sunday in the Sparks Center Great Hall for the Honorary Degree Luncheon. 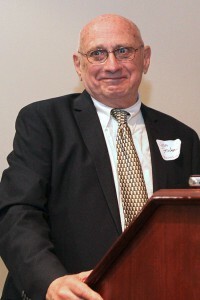 Fischer at the podium during Saturday’s reception given in his honor in Detchon Hall. “’Feckless’ is just such an appropriate marker for your approach to students,” Hartnett said in honoring his mentor. “You didn’t view us as though we were flawed, but just as if we were in need of a bit more oomph and direction. To be called ‘feckless’ by you sent a clear message: Get off your rear end, face the task in front of you, and get to it. It’s a word that warms my heart when I hear a rookie faculty member use it even today, since it means that Fischerian spirit, so central to good work at Wabash, lives on. So when John Fischer talks about what Wabash is all about, we’re wise to listen. “That ‘intimacy’ seems to be at the very heart of what we are all about and what I think of when I contemplate my years here. The key to it all is the relationship between professor and student, advisor and advisee, the open and not shut office door. “I recall my advisees with great pleasure and think about all of the things we talked about whether in my office, in the Scarlet Inn, in a fraternity or dorm, or in my home. We talked about everything… One becomes friends with current and former students. I have had the great good luck to be part of many of my former students’ lives. Dan Degryse ’83 greets his former advisor and teacher. “Teaching here was great fun and I learned how to teach from my colleagues, the remarkable Jack Charles and Ted Bedrick. The combination of their mentoring and my classes with first-rate students made me a better teacher. I also learned other things outside of the classroom about the Midwest, soccer (my involvement with the beginnings of soccer here was a different education—I could not be prouder of my own players back then and their successful contemporary descendants). I also learned about the Monon Bell which resides, I am happy to say, where it belongs. “The genuine openness of the Midwest and, more importantly, its native, bright students was a gigantic discovery for me and watching these students come to the College, find their footing, and move on is still something I regard with pleasure and delight. I was involved for some years with the off-campus study program and it was simply fun to help our students to find somewhere they could augment their education. 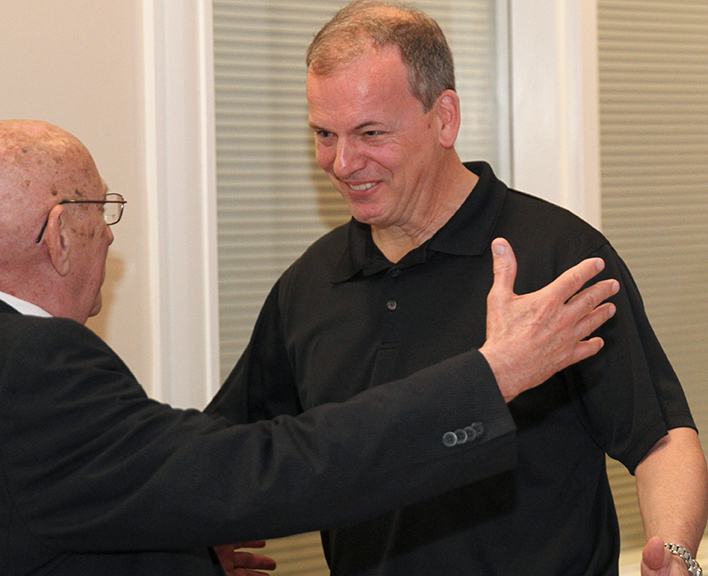 It was a sheer pleasure to behold the energy and life such an experience would add to a young man’s time at Wabash. “I also was advisor to the Lambda Chis, which was fun, interesting, and challenging. I enjoyed the relationships formed there and was happy to watch young men come in their first year and emerge four years later with firm sense of self and sound bond with the College and the fraternity. “Thus, I taught and was educated myself in numerous ways during my four decades here. I reveled in amiable colleagues and bright eager students. Richard Paige — For Ryan Smith ’03, it was just a thought one day on the way to class. Smith, an Emmy Award-winning field producer for CBS News, has done that and more. Not only did he serve as a page for a year with the “Late Show with David Letterman” after receiving his master’s degree at Columbia University, but he was also part of a large team that prepped last night’s 90-minute special, “David Letterman: A Life on Television,” which aired on CBS. The journey into television has been an amazing experience for Smith. 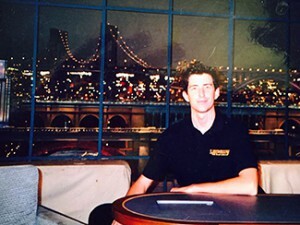 Ryan Smith ’03 is one of the lucky few to sit at David Letterman’s desk at the Ed Sullivan Theater. Working on the “Late Show” helped Smith learn how a television show is produced, connect daily with audience members, and get a sense of what needed to be accomplished. Those skills translated well when working with the senior staff at CBS News in getting a show to air. Smith credits the expectations that his Wabash professors had for him as one of the reasons he’s felt comfortable in television news. The mindset of accepting new challenges; that no day or story is quite the same. As Letterman’s late night career comes to a close after more than three decades, Smith is proud that his television experiences – both with the legendary host and CBS News – have come full circle on the Letterman retrospective.